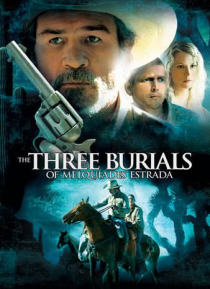 When brash Texas border officer Mike Norton (Barry Pepper) wrongfully kills and buries the friend and ranch hand of Pete Perkins (Tommy Lee Jones), the latter is reminded of a promise he made to bury his friend, Melquiades Estrada (Julio Cesar Cedillo), in his Mexican home town. He kidnaps Norton and exhumes Estrada's corpse, and the odd caravan sets out on horseback for Mexico. As Estrada's body … begins to rot, Norton begins to unravel, but Perkins remains determined to honor his vow.